Years ago when I was an actively involved in Girl Guides, we had a guider who loved to craft with us. She was full of great ideas, such as these cute little pumpkins. We were always decorating our meeting space for the changing seasons and it was then fun taking the treasures home afterwards when the next season arrived. My oldest made this pumpkin when she was in Girl Guides and I couldn’t wait to pull it apart and figure out how it was made! 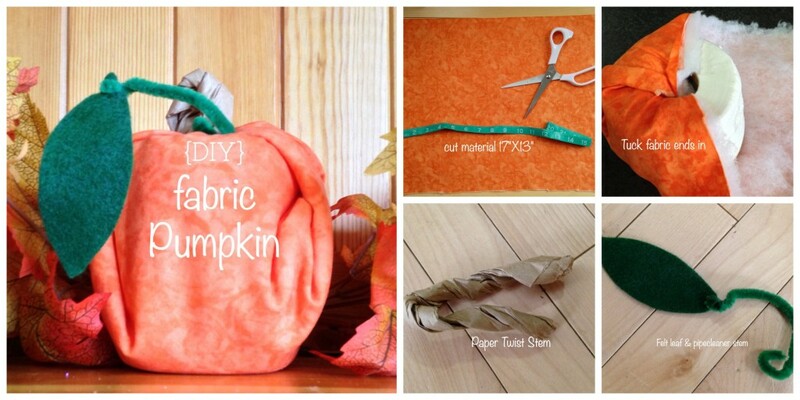 Here’s how you can make your own cute DIY fabric pumpkin in five easy steps. 1. Cut orange fabric and batting into a rectangle 17 inches long X 13 inches wide. 2. Tuck fabric into the toilet paper roll. 3. Trace out a fabric leaf, punch a hole in the end and thread in your pipe cleaner to make your leaf. Crinkle the bag and then roll the paper width wise. Twisting the paper (like you are ringing out a wet cloth) then bend your stem in half. 5. Tuck stem into hole. Twist the pipe cleaner leaf and secure it onto the stem. What a cute and easy way to decorate your home this fall with your own DIY Fabric Pumpkin. Oh, and for the record… don’t store them in the bathroom for obvious reasons. 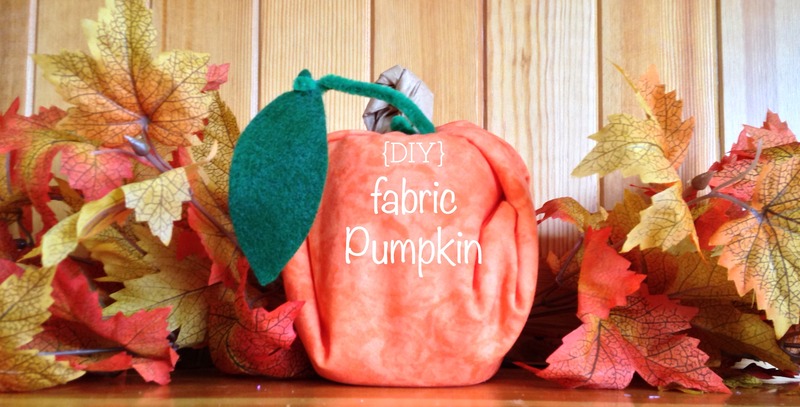 I hope you get a chance to make a few fabric pumpkins for yourself! That looks really cute. I would love to something like this for a fall decoration myself. I really love to decorate the house for fall. I am going to share this with my mom. She is very crafty and would love these. I hope that she does! Thanks for sharing…I really do appreciate it! My oldest daughter is so crafty. She would love to make one of these. That is really cute and so simple. I have to try to make it this year. What a great project! That is soooo cool. I may have to make these instead because I just hate when our real pumpkins start going bad. I need to pull out my fall and Halloween decorations! We just started getting everything out. Fall is such a short season here in Alberta (we get snow end of October)the leaves on the trees are already changing colors and starting to fall. That is just adorable! I love how easy it is to make, also. Great! I love easy projects that don’t look like they were easy. This is so darn cute! I am not an avid DIY’r as I am not really good at things like this, but this seems so simple and easy that even I could do it. Thanks so much! I love Fall decor. I have had more than my fair share of FAILS for sure. I wrote a post last summer about our “glitter boot fail” because the paint I used just wouldn’t set! Doesn’t stop me from trying but I stay away from crafts that are out of my league. Awww, that is so stinking cute! What a great idea to use a roll (or half a roll) of toilet paper for the base! Nice and sturdy and kind of gives you the perfect shape! That is SO cute! Love that you used a roll of toilet paper. Perfect for playing with the size of the pumpkins. If you want a bigger pumpkin grab a bigger roll. Oh. I love this pumpkin! Adorable!!! We used to have ours there…until I found the roll of toile paper missing! Practical hiding spot for sure. So quick and easy! My kids are going to love making fabric pumpkins this year 🙂 Thanks for sharing! I hope they have a blast! My three year old put ours together (and took it apart again). Challenging enough for her but simple enough for anyone older than 4. This is just so cute and looks like it’s easy to make and doesn’t require tons of time! We will be trying this out soon! The most time consuming part of the entire project is getting the material you need to do the project. Once you have everything together it takes less than 5 minutes. That is the cutest thing ever. I love how it came out. I want to make a couple of them for our fireplace.